Opportunity to invest in income-producing development land that is appreciating in value daily. 71 acres along southbound I-35. Outside city limits. 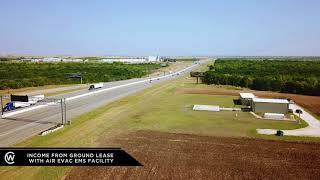 Approximately 3000 ft of I-35 frontage. The property lends itself to numerous types of development. Property is currently generating lease income from 2 billboards along I-35. Application pending with TXDOT for up to 2 curb cuts.